Happy first of November! I’m sharing my favorite pumpkin pie recipe again this year because it is SO GOOD, SO EASY, and this time around it has Martha Stewart’s stamp of approval. 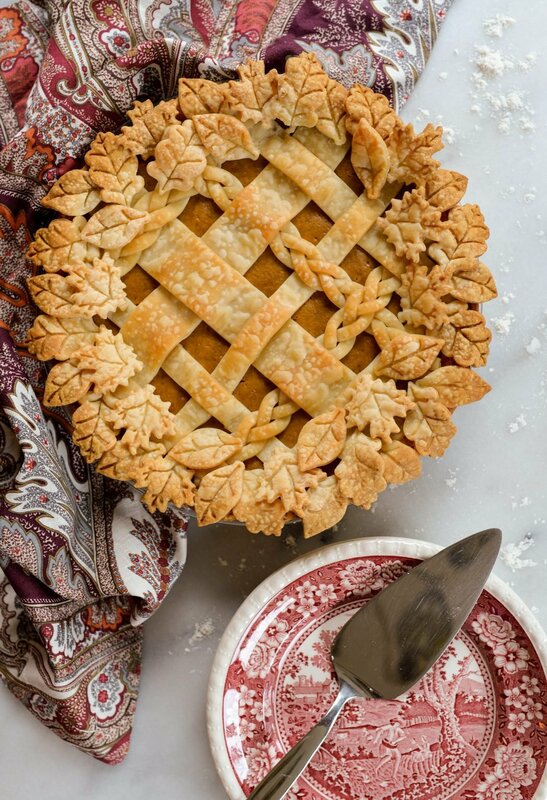 🙂 You’ll probably make at least one pumpkin pie this season, and you can either make a normal easy pumpkin pie or you can make a gorgeous easy pumpkin pie. I made this pie to bring to a festive fall dinner party last week and I got so many comments on my Instagram story I thought it was time to share the recipe! While I’ve made pumpkin pie from scratch (making the crust, carving a real pumpkin) I think nothing tastes as good as pumpkin pie made from Libby’s Famous Pumpkin Pie Recipe – EXCEPT with one little substitution. A few years ago I accidentally swapped sweetened condensed milk in for the recommended evaporated milk and it made all the difference – creamier and a little sweeter. 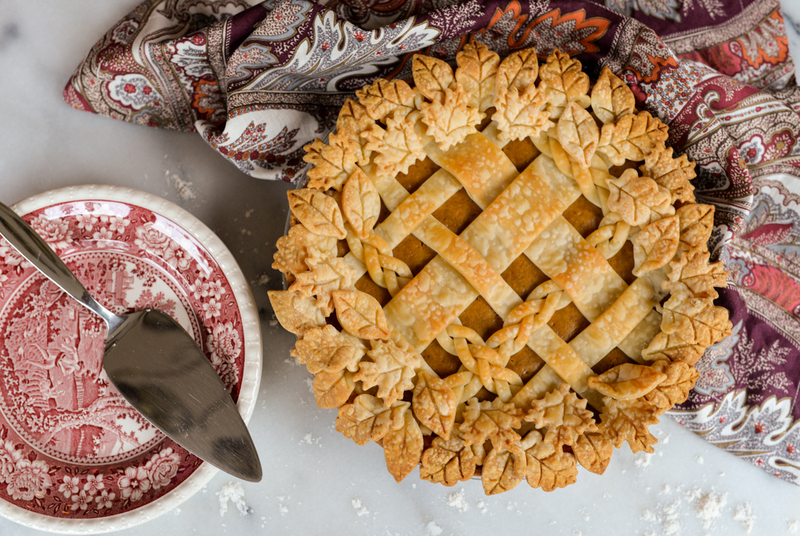 I’ve used sweetened condensed milk ever since and this time added a little flourish by adding a braided lattice weave crust on top – perfect for those of you that eat pie just for the crust! Or those that want to bring something special to your next fall gathering. DM me photos of your pies on Instagram if you make my recipe! I’d love to see them! Let the pie crusts warm up a bit then lay one crust in the pie dish. Set the other two aside for later. Combine sugar, salt, cinnamon, ginger and cloves in small bowl. Beat eggs lightly in large bowl. Stir in pumpkin and sugar-spice mixture. Gradually stir in milk. Pour into pie shell. Bake for 15 minutes at 425 degrees. 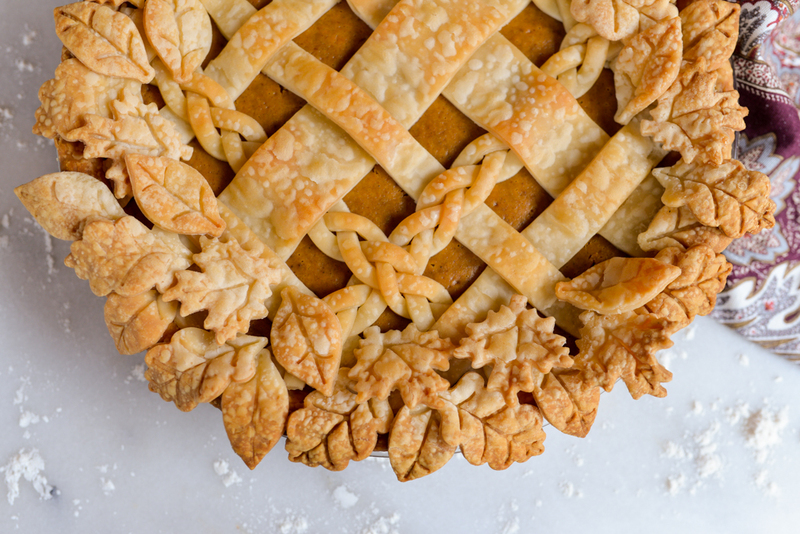 Reduce temperature to 350 degrees F.; bake for another 30 minutes until the filling is set just enough to hold up the top lattice crust, but not fully cooked. Remove from oven and place pie on a wire rack. While the pie is baking roll out the two additional pie crusts on a marble pastry slab and prepare the lattice for the top of the pie. I cut two 1.25″ wide ribbons, four (.5″) half-inch ribbons and made three braids for the lattice. I used these pie crust cutters to cut out the leaves. 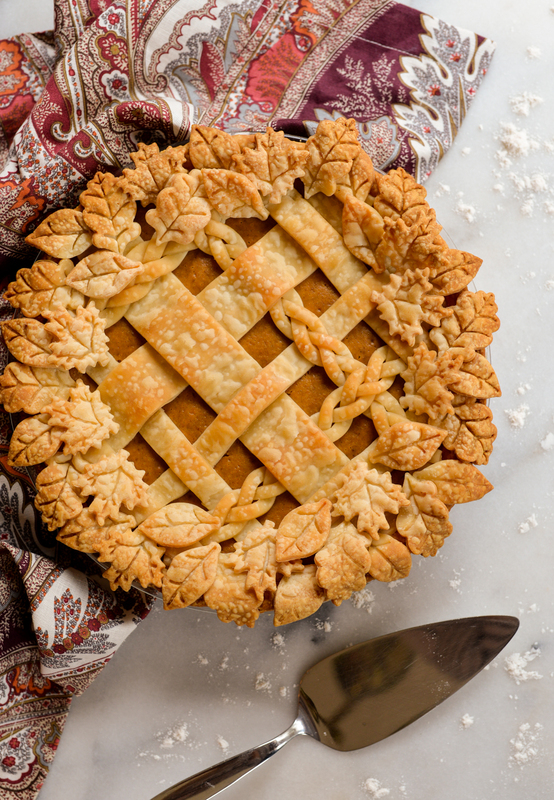 Place a layer of wax paper on a cookie sheet and start weaving your lattice pie topper on the wax paper. Alternating each ribbon over then under as you go. I then pull the edge of the wax paper around the cookie sheet so the lattice falls off exactly here I want it on the pie. (This way you don’t tear the pumpkin pie filling.) 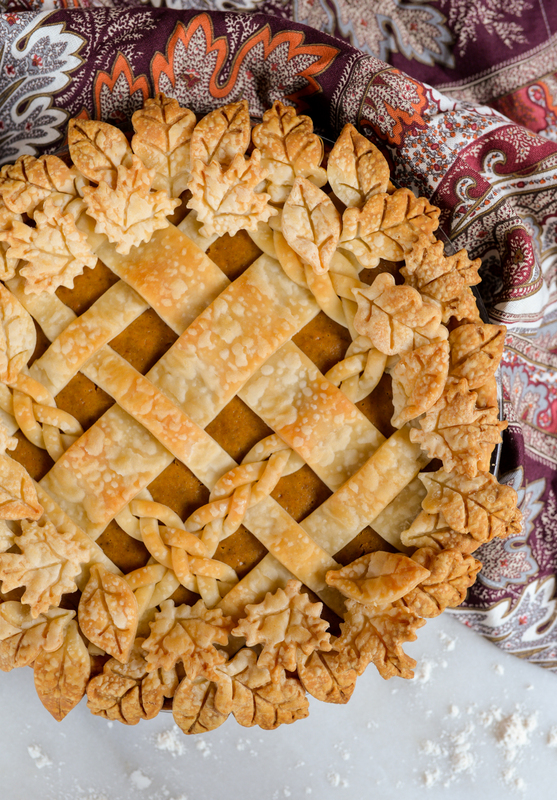 Scatter the leaves around the edge of the pie crust, using a little water to make the leaves stick to the existing crust and lattice. Find my complete fall-themed dinner party plan including decor ideas and a 4-course menu here. And be sure to SUBSCRIBE HERE for regular recipes, entertaining, interior design and travel inspiration sent right to your inbox! This looks lovely! Trying it tomorrow with both of my daughters. A rare time for us 3 girls to be together. Pie time!